Is Your House Properly Grounded? Electrical grounding is where a point in a circuit is at zero voltage. The point may or may not be connected to earth, though. A wire that is directly connected to earth is also at ground. For your home to be properly grounded, there must be a physical connection between the ground and your home’s electrical components. For the majority of your electrical devices and appliances, this is accomplished with the round third prong that your electrical cords often have installed. Whenever the system is properly grounded, this connection allows a safe pathway for any excess or misdirected electrical current. 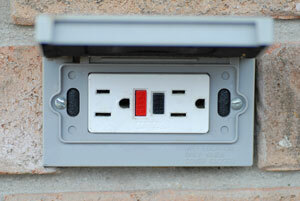 This can potentially save you from electrical fires and deadly electrical shock. The areas that experience the most electrical grounding problems are large cities and suburban areas. This is simply because these more densely populated locations have a higher level of electrical demand, leading to an increase in issues. Electricians in large cities fight a constant battle with improper grounding, and the resulting problems that result from it. For example, whenever metal pipes or conduit come into contact with an exposed wire, it can lead to a potentially fatal electric shock to any humans or pets that touch them. For this reason, it is paramount that you make sure that your electrical system is both in safe condition and properly grounded. If your home is improperly grounded or not grounded at all, then you run the risk of many potentially dangerous problems. If you live in an older home, it is possible that your home is not grounded at all. Newer homes, as a result of increased safety regulations, are typically grounded properly. That being said, all your safely grounded system needs to be rendered completely ineffective is a few bad connections. For this reason, you should have your electrical system inspected regularly by a qualified, local electrician, especially if you believe that you may have an ungrounded or poorly grounded electrical system. The greatest risks posed by an ungrounded electrical system are fire and electrical shock. Because electrical current always moves along the path of least resistance, you are directly at risk of being shocked if you are using an ungrounded device when it discharges excess electricity. In a fully grounded system, any excess or misdirected current is channeled into the ground connection and into the ground. It is very possible that you could end up becoming the ground connection if there is not one already in place. This could lead to serious injury or death. In addition to the risks posed to you and all of the other people in your home, ungrounded electrical systems can be potentially hazardous to your electronics. This important safety feature takes the extra electricity away from your device, which can save your electronics from catastrophic damages and incremental wear and tear. As a result, your appliances last longer. Don’t take the risk. No matter how old your home is, you should consider having an electrical safety assessment on a regular basis in order to identify any potential or existing problems that could lead to an unsafe situation. This important step in home maintenance can keep you and your family safe for years to come. When was the last time you had your home inspected for electrical issues?